Ballpark Estimate: $10 to $1,000 for a necklace, ring or bracelet. If you love the look of diamonds but can’t afford to splurge on the real thing, you might want to consider buying some beautiful cubic zirconia pieces. Cubic zirconia jewelry offers the same sparkle and brilliance that you get with genuine diamond gemstones but at a fraction of the cost, making it possible for people on even the tightest budgets to add some “wow” to their jewelry collections. You’ve probably heard of cubic zirconias but you may not know much about their origins. In fact, cubic zirconias or CZs are synthetic gemstones that are created to replicate the look and beauty of diamonds but at a much lower cost. They are formed using a natural mineral that is melted at high temperatures and then cooled. The resulting material is cut and polished in much the same way as mined diamonds. For the past 25 or 30 years, cubic zirconia stones have been produced commercially to make costume jewelry. Today, cubic zirconias are also sometimes referred to as faux or simulated diamonds. In general, the stones are colorless and flawless and have great fire, which means that a high quality synthetic stone can compete with the highest quality diamonds. You can also buy cubic zirconias in a range of fancy colors, which makes them perfect for statement jewelry pieces, such as necklaces, bracelets, pendants and rings in all shapes and sizes. The saying may be that “diamonds are forever,” but in fact, they are also not for everyone. While many people appreciate the beauty of the precious gemstones, they may not want to support the diamond industry, since the practice of diamond mining is very controversial and has been linked to rumors of child labor, cruelty and even violent deaths. In addition, the cost of diamonds (which is considered by some to be highly inflated) leaves some jewelry-lovers seeking more affordable options. That’s where the appeal of cubic zirconias comes in. These made-made gems are easy to access and also easy to afford. Better yet, you can easily find them in a range of designs and prices that are sold in a variety of jewelers, department and discount stores and online. Many celebrities are known for wearing fabulous jewels, both on the red carpet and also off it, as well. But even though most can afford to invest in the most precious gemstones money can buy, some of these trendsetters are opting for high-quality, large faux stones. The affordability and accessibility of cubic zirconias make them a great choice for the largest statement pieces and can also be great choices for people who travel often and want to wear bold jewels but prefer to keep their most valuable jewelry in the safe at home. Better yet, the untrained eye often can’t tell the difference between real diamonds and synthetic substitutes. You can find cubic zirconia stones in a variety of setting options. In general, the least expensive and lower quality stones are just set in inexpensive metal. If you are just looking for some fun jewelry pieces you can wear once in a while and don’t mind if they tarnish or lose their luster, then this may be a reasonable choice. If you want a bit nicer quality but don’t want to spend all that much, sterling silver or vermeil (18 karat gold layered over sterling) are also good options that typically house middle of the road-quality synthetic stones. Some jewelers also recommend settings made from titanium and tungsten, which are hard metals that are scratch resistant. For the best stones, though, you may want to invest in those set in 14 or 18 karat gold or even platinum. Experts say that the general rule of thumb is that the better quality stones with the best finishing techniques are set in the better metals, as is the case with the better quality diamonds and other gemstones. The more expensive settings are often used to house Russian cubics, which are considered to be a superior stone because they are hand-cut and polished (while the less expensive versions are mass produced) to show off the most fire and brilliance. You can also find a variety of items featuring cubic zirconias that are mixed with other precious and semi-precious gemstones to create the same effect as diamond and gemstone jewelry but will cost much less. When shopping for cubic jewelry, you will want to choose one with the best cut and well-placed, even facets, since a skillfully cut stone will show off its best assets. As with a diamond, the stone cutter examines the raw stone and works with it in order to play up the true beauty that exists. A beautiful cubic zirconia that is cut in the same way as a diamond with the same level of skill will have the same effect. You don’t need a genuine diamond to prove the value of your relationship. That’s why some brides and grooms in this day and age opt for cubic zirconia rings to symbolize their commitment. While in the past this would have been unusual since the diamond was an important status symbol, it is becoming an acceptable practice to wear faux gemstones for everything. In addition, many brides enjoy cubic zirconia necklaces, bracelets and even tiaras or other hair ornaments to compliment their dress. If only genuine diamonds will do for you, you can expect to shell out a few thousand or even much more for a small, nice quality stone. But it you decide to go with a cubic zirconia instead, the same ring can be found for a fraction of the cost. Jewelers say that you can find similar quality cubics for about a tenth or even less of what you would pay for traditional diamonds. 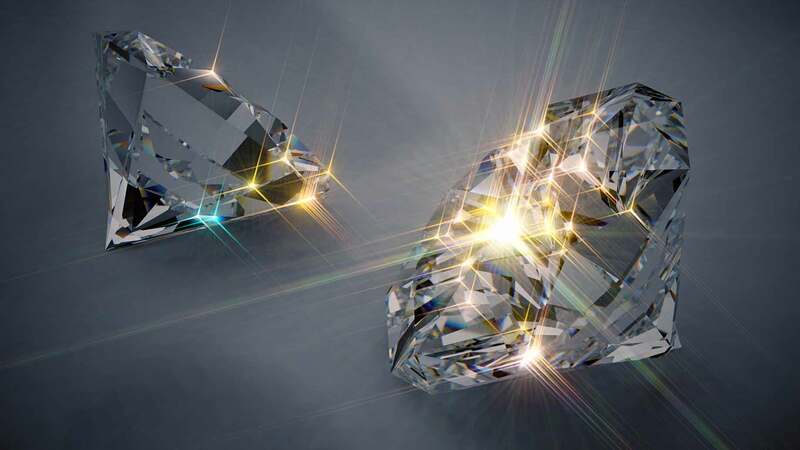 While diamonds are measured by carat weight, cubic zirconias are actually much heavier than diamonds, so they are not sold by their actual weight (which is about 50 to 75 percent heavier than a similarly sized diamond) but instead, but by their “carat equivalent” to diamonds. The grade of cubic zirconias also affects their price. You can find cubics in three grades: A (low), AAA(middle) and AAAAA (highest). The middle grade is what you will find in most jewelry pieces, as this is a beautiful-looking stone that is still very affordable. So you can expect to spend anywhere from $10 to $1,000 for a cubic zirconia piece of jewelry, with an average price of about $100 or less a carat for very good quality stones. If you plan to invest in a nice quality cubic zirconia piece, you may also to consider the other synthetic diamond substitutes available today before making your purchase. Some people like moissanite, which is a lab-created stone that is popular today. The downside, though, is that it costs more than cubic zirconias (about $500 a carat) and some experts say that it does not have the same fire. You may also want to look into Diamond Nexus. This man-made stone is a relatively new option that can be very comparable to a cubic zirconia both in look and also in price.